The Online Photographer: New FILM Camera—What? Nikon's Best High-ISO Performance Yet? Fujifilm, living up to its anachronistic company name, has a released a new film camera—the Fuji Klasse W, a "premium point-and-shoot" with a fixed 28mm ƒ/2.8 Super-EBC Fujinon lens. The camera is a limited edition of 8,000 units, and will be offered for sale in Japan only. Stateside, therefore, the only place you'll be able to get it is through the Japan outlet Megaperls Webshop, the unique independent exporter of Japan-only photo products. It's a bit on the expensive side at ¥86,000 ($746.17 at this morning's rate of exchange), but the folks at Megaperls tell us it's a solid, substantial camera. Note also the matching Klasse W carrying case on the Megaperls page. Posted by: MIKE JOHNSTON, with thanks to D.R. It looks lovely. Anachronistic, may be, but in the same way a Technics 1200 Turntable is. I'd love to have one (of both). 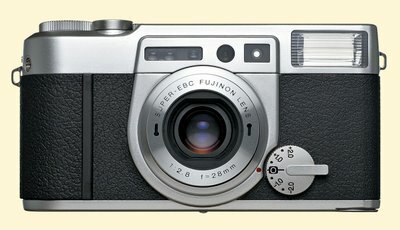 Seems rather stiff when compared to the price of the Contax T3, Nikon 28ti or Ricoh GR-1v when they were still available. It looks a lot like the "old" Rollei AFM35 (which had a 40mm lens). That was a Fuji in desguise as well. This one looks really good. So why can't they put a 28mm f2.8 Super EBC Fujinon lens on one of their digital compacts? Is this a market probe of 8000 units? If so, I'd be very happy to see it in normal production! Are they sill producing their MF rangefinders? "Is this a market probe of 8000 units?" I very much doubt it. In fact I think that a rather optimistic production run. But then, what do I know about the Japanese camera market? does anybody know how the sale goes? I mean, do you think the sales of film cameras can justify the production of the film? "I mean, do you think the sales of film cameras can justify the production of the film?" It's definitely the sales of film that have to justify the prioduction of film, not the sales of cameras. Even, I would imagine, when it's the same company making both.